Bathroom wet area back to wall or built in bath advice please? Hi there, we are getting a wet area in our bathroom (shower and bath next to each other behind a shower screen - see pics) and undecided on a back to wall freestanding or a built in bath. Both have their cleaning difficulties - floor at side of back to wall, and grout lines on front of built in. I’d prefer the look of the back to wall freestanding but the width of the space is 1800mm so we could fit a nice big 1800 built in bath but the back to wall would be only 1580 to ensure enough cleaning at sides. What would you do?? 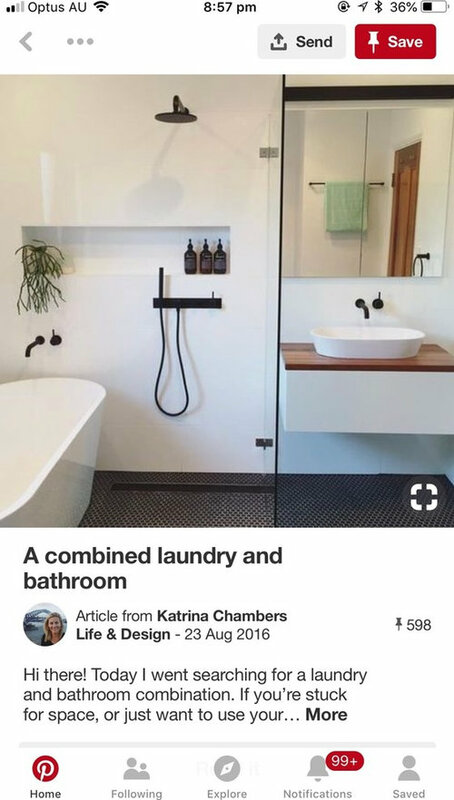 And our plumber and builder do not know how they would slope the floor for drainage if we do the back to wall freestanding as the bath has to be on a flat surface. Does anyone have a similar setup and can tell me how they did it? 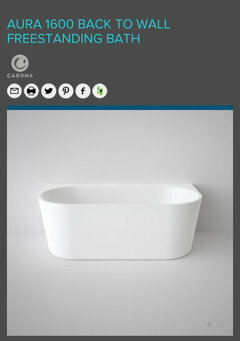 There are D shape baths they are in between, flash with the wall at the back and looks like freestanding from the front. Thanks guys, yep it is a back to wall freestanding bath we are looking at as mentioned in my question so no cleaning behind required. I’m curious about cleaning these areas, I figure the bath will get wet every time you have a shower, so probably extra cleaning if the bath isn’t being used..
Maybe he can built like a tiny platform for the bath like only 10-15 mm high , make it look like a feature and slope tiles around it for the shower area. This is reverse of what they do for a shower cubicle, they lower the floor 10-15mm so water doesn’t go out. We have same set up (recent reno) and tiler and builder said same about the slope so I went with built in bath. The surround works really well to put towel on while in the shower and for shampoos etc. so can be a useful addition. if heart set on back to wall then think earlier suggestion of a raised platform could work but will take up floor space. 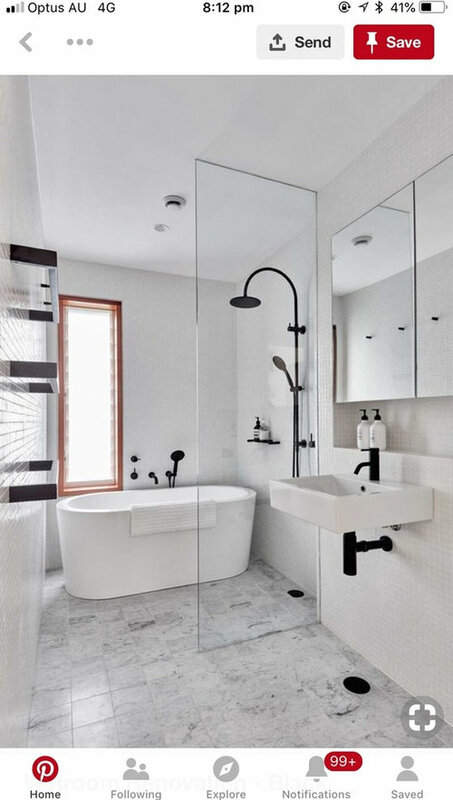 Freestanding baths are a statement of opulence - ie lots of space, room to put your arms out, plumbing in the middle of the room and often positioned to achieve fabulous views - having them banged up against the wall in a suburban bathroom seems to defeat the purpose somewhat. 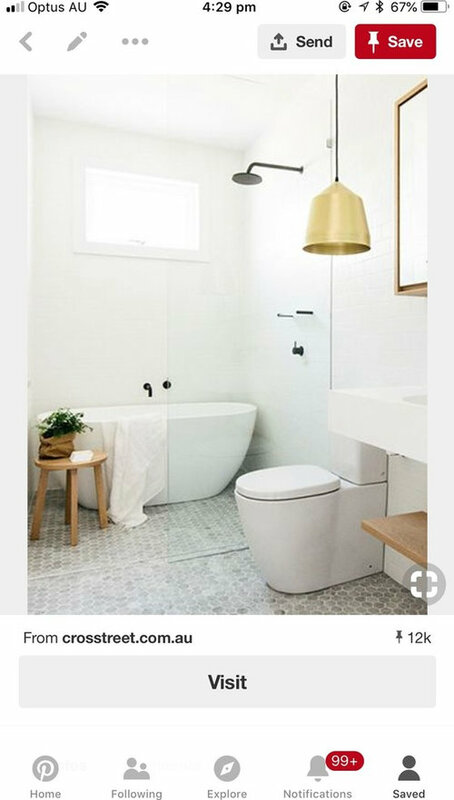 This is the back to wall bath we’re looking at so it’s really not actually a freestanding, really great for small spaces or if you’re not into cleaning round the back of a bath. Thanks Jan. Great article! If we can make it work in the space we would definitely prefer the look of the back to wall. 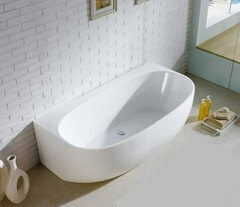 How big is your space, ie how much space at either end between the bath and walls? And did you have yours next to the shower in a wet area? 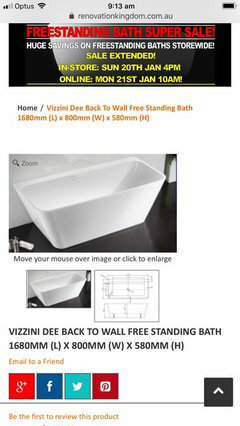 I just spent some time goggling “levelling a back to the wall bath”. Almost cured my insomnia. There is a lot that you could learn to be able to discuss with your builder. Some baths seem to come with feet that allow for a slight adjustment. And a long drain instead of a single point seems to be popular. Hi again, Susie. We’ve allowed 300mm at each end. This will allow my stick vacuum and mop to fit and, because of the squared off then curved shape, will still allow comfortable ‘hands and knees’ reach if necessary. What I found useful was to ’dummy up’ a trial in our current house (we used bricks, an old bit of plywood, cushions and string lines). Made little things, like allowing enough room for your head to rest over the bath end, apparent. 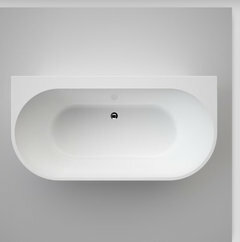 As mentioned, like you, we’ve chosen a back to the wall bath, one that has a curved, rather than angled internal shape and that came about because of the trial. 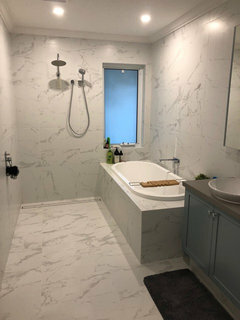 Hi Suzie, I contacted the Architect Megan Burns at C M Studio who did the bathroom in the first photo you posted, she very kindly replied the following. Its just a tray drain with the tile inset... its reasonably standard. Best to get a custom length to fit your space. " Thanks siriuskey! Very kind of you and her. Wonder how she sloped the bath and shower floor towards the drain! The slop falls directly to the tray drain so each side of the bathroom falls only the one way. The shower screen just needs to be on the outside of the drain to make it work for the shower. Thanks siriuskey, it’s this photo I think you’re talking about? I think I understand what Megan means - it would mean the whole shower and bath area is on a slight slope towards the drain? Our builder thought that a freestanding/back to wall bath needs to be on a completely flat surface hence we didn’t think this was going to be possible without water pooling on the floor next to the bath, I’ll need to investigate this further! what trees and shrubs - brisbane?